Every so often you see product recalls for mountaineering equipment. In the last year, for example, Petzl has issued product recalls for Scorpio via ferrata lanyards and some GriGri 2 belay devices. Most of the time I just glance at these notices, but the Edelrid notice grabbed my attention because I’ve used Edelrid lanyards for the last couple of years. My model isn’t covered by the recall and so I’m saved the hassle of returning the set for inspection and repair. But this particular recall has got me thinking about is the trust we place in both our gear and the people who make it. Any rock climb involves relying on multiple pieces of equipment. Each of these items has a different history in which a multitude of factors could have affected its reliability. This history includes the complex process of manufacture. This is why we rely on manufacturers being open and honest about when something has not been manufactured to the standards expected. There are good reasons why manufacturers issue product recalls. There is the need to limit legal liability and so any potentially costly legal penalties. There is also the need to avoid damaging publicity. A product recall might create bad publicity, but not anywhere near as much as not issuing a recall and customers being injured as a result. Recalls may also be costly in replacing or repairing the affected product, but they are cheaper than the costs associated with a tainted brand and reduced trust in the company. As such, product recalls are common sense, however, it’s worth remembering that in the past companies have been reluctant or slow to issue them. The classic example of this is the Ford Pinto, an early subcompact car. The design of the Pinto’s fuel tank meant that it had a tendency to burst into flames when the car was rear-ended, even at low speeds. Ford was apparently aware of this potentially fatal problem, but decided it was cheaper to settle legal claims for damages than to issue a product recall. This design problem allegedly led to three deaths. Following court action, Ford recalled 1.5 million Pintos in 1978. The Pinto case can now seem like an extreme example, but it’s worth remembering that whether a product recall happens depends on the decisions of people. They will make a decision on the basis of some form of cost-benefit analysis and their own personality and beliefs. In making such decisions, people can sometimes be self-serving and short sighted. This is why good regulation and company culture is needed encourage people to do the right thing. In mountaineering related activities, this regulation comes from the UIAA (International Mountaineering and Climbing Federation). They set the standards expected of equipment and only those products certified by the UIAA as meeting the required standards get to carry the UIAA Safety Label. For those occasions when something goes awry, the UIAA even has an online directory of product recalls. It’s also important that the customers of mountaineering equipment manufacturers are also very safety conscious and would take badly to not being told of an issue with the gear on which their lives can depend. All this means that my trust in my gear and the people who make it is probably well founded. Its unlikely a mountaineering gear company wouldn’t issue a product recall. Edelrid did, after all, issue a product recall as soon as it became clear that there might be an issue with its products and this was soon zipping around the web. I guess this means I can trust my lanyards. UPDATE: There have been further recalls of via ferrata lanyards since this post and an update can be found here. You could become a mountaineering writer. Good article. In the states we say “Father knows best.” Seriously, that was thoughtful. We definitely need to be careful with our gear. Keep up the good work. Very useful information! UIAA still recommends “Y” lanyards working with mechanical absorber instead of more modern “V” lanyards with elasticated webbing. I still stick to the traditional stuff either so i use an essential Petzl Zyper with standard “K” karabiners or similar for a simple reason:it’s the only one i’ve seen working well on the field. Anyway i consider that in some vertical sections a fall can exceed 5mt./6kN and consequences are easy to imagine,some rubber stoppers one vie ferrate pins are being tested and very frequented ones are checked every spring usually by UIAGM-qualified guides (and montain rescue members too) etc. First of all,don’t fall off,which is not that obvious especially for people used to climbing walls and sport climbing and trust your gear just in case you cannot do any different. I certainly try my very best not to fall off. It’s also nice to hear that pins are checked. I don’t understand your comment. I thought that a V lanyard was now forbidden, since the mechanical absorber is half-way along the rope between the karabiners and only one karabiner is attached at a time. Attach both, and there’s no longer a shock absorber and if you fall you’re toast. I believe this may be what happened to someone who died recently falling from the via ferrata at Crolles in France. The Y lanyard on the other hand has two karabiners, each of which is attached to the shock absorber and therefore both can be attached at once. Then you have the choice of absorber, either a mechanical thing with rope being pulled though a plate or similar, or a webbing strap that pulls stitching apart progressively to kill the energy. Thanks. You’ve raised an important issue about lanyards and safety standards. There’s a few things I want to add, because there’s some important stuff to clarify. The original and older type of via ferrata lanyard is the V type. This uses a single length of rope that passes through a shock absorbing device. The point you make about only using one of its two carabiners at a time is really important. The only time both carabiners should be attached to the cable is when moving past a pin and then only to avoid being unclipped entirely. As you say, the newer type is the Y type lanyard. With Y type lanyards, both carabiners must be clipped to the cable to properly arrest a fall. There is a summary of these two types on the British Mountaineering Council website at http://www.thebmc.co.uk/tech-skills-via-ferrata-equipment. There are two standards that apply in Europe to via ferrata sets. EN 958 is the European safety standard for energy absorbing systems such as via ferrata lanyards. Both V and Y type lanyards meet this standard. UIAA 128 (see http://theuiaa.org/upload_area/cert_files/UIAA_128_EASyst_2009.pdf) is the other standard and is more stringent than EN 958. V type lanyards do not meet the UIAA 128 standard, but Y type lanyards do. This maybe why a lot of manufacturers now don’t make V type lanyards. However, some manufacturers (e.g. Mammut) continue to make V type lanyards and you can still see them in use. There is a useful summary of standards and related labels at http://www.mammut.ch/en/viaferrata_quality_tests.html. Hi, I don’t think both arms of a Y-lanyard need to be attached. I think the idea is that one will suffice, and with the second you get (a) a little extra security in case of a carabiner problem, and (b) the ability to be constantly attached as you move one carabiner then the other when passing an anchor point. It’s interesting to hear your view on this. I don’t think I’d like to take the risk of just using one carbiner on a Y lanyard. Everything I have heard or read, including instructions from manufacturers, says two should be attached to the cable (except, obviously, for when you are passing a pin). The consequences of using just one and being proved wrong are just too serious. As it’s not too much effort to keep two carabiners attached to the cable, I’ll keep using both. I will quite often use only one when I’m walking along a path, for example. Somewhere where the shock of the fall is going to be far less severe, and indeed the risk of falling off is close to zero. On sections where I’m climbing, on the other hand, always always both attached. In those cases you’re right, if you have two then why not use them? Yes Ian,i agree that both V and Y self-built using a few meters of 9-11mm. 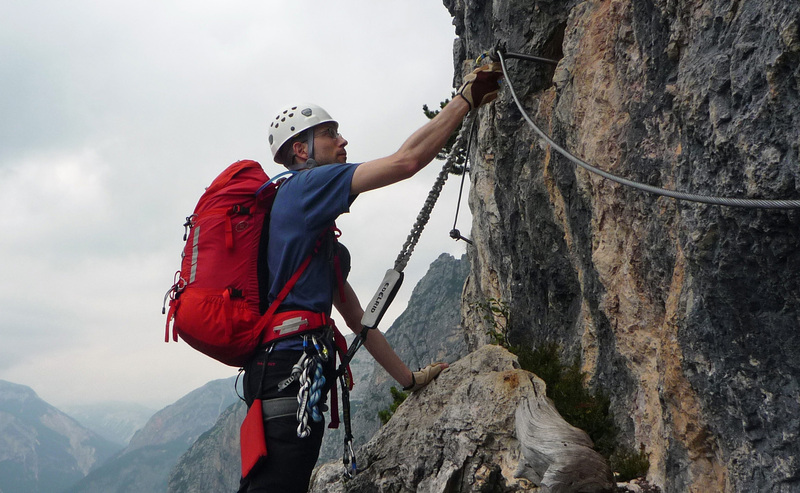 of single rope,two K-type carabiners and a mechanical absorber are now obsolete because now a large choice of EN958/UIAA128 via ferrata sets is available on the market and safety standards have made an important step higher,but once there was nothing better than that,the first modern set appeared in the Dolomiti in the mid-90,made by Salewa with surprisingly modern automatic connectors. unsafe devices and all the points in between and they must be free to do it,in the sense that there is no liability both for the guides responible for vie ferrate maintenace and the rifugio owner you’re likely to find near many vie ferrate,the freedom that such unexperienced people don’t have is to make someone else’s risk his own life to save theirs. Above all,a bit of climbing skills and alpine environment experience are more important than any gear you may own. I think that knowledge and experience usually results in people using the right gear. It may be that tourists don’t know the features and risks inherent in the gear they are using. The question is – who educates them? I don’t think there is an easy answer to that question. I think that sometimes it does fall to other climbers and to people like guides and rifugio owners to offer some friendly advice. However, it is ultimately each person’s own responsibility to make sure they are safe. I think it’s up to everyone to speak to the persons involved whenever they see equipment that is unsafe or not properly used. Living near Grenoble I do the via ferrata there at least weekly, and in the summer often several times a week. I often see people climbing with nothing at all, with equipment that they don’t use, or with inappropriate equipment. Those doing free climbing I don’t bother with. They know the risks, and all of them that I have seen were clearly very skilled – though not in falling off vias. To anyone else I point out what is wrong in case they don’t know. 1. “Yes, I know, but I didn’t have anything else handy”. This from two young English guys who each had a series of quickdraws strung together in place of proper lanyards, no shock absorber. I also saw a group last sunday where three had proper gear, and two had only webbing straps and quickdraws. Their reason was they didn’t have enough equipment for all of them, and anyway they are experienced climbers. For me, not enough equipment means those without stay home. 2. “Really? Wow, I never knew! Thanks!”. Often people just don’t know the dangers, and people like this have usually hired their gear. But it’s worse than a pity that the hire shops don’t educate like they should. My favourite was a guy who was about to make his own safety lines. At the foot of the via. He had some rope, a metal plate with holes (proper bought thing), carabiners, and obviously no clue what to do. I said to him that he shouldn’t attempt that if he didn’t know how to do it properly, and that he could end up dead if he fell. I continued up the via leaving him waiting at the base. The next day by chance I met the same guy, now with brand new Petzl Scorpio lanyards. He said I had scared him so much that he went home, and next day bought proper gear. A good result. So we must speak, and sometimes we might even save a life. I agree – you might have saved a life by speaking up. I always worry I might get a negative reaction if I say something, so I’m interested to see that your experience has been positive. Maybe I’m just too used to living in London and the short tempers of some of people who live here. I only have to think about your example of a guy making his own safety lines to know I should overcome these feelings and say something. I also agree that the hire shops must educate people about the use of the gear and the risks. I’m amazed some gear shops don’t. Yes,those cone devices “which optimise carabiners placement during falls” and avoid lateral flexion,were developed by Kong and adopted on the most recently built vie ferrate,in spite of the non-proliferation policy on Dolomiti area. Thanks for picture,it was certainly taken on via ferrata degli Alpini because i can recognise the Falzarego Towers;someone is climbing on the South-East face on the left,as usual…see:www.guidedolomiti.com/wp/ferrate/ferrata-degli-alpini English version page. Yes,most of vie ferrate are professionally checked section by section,pins and cables and even the whole rockwall,in some cases and a final certification is issued. On the other hand,some vie ferrate are nearly abandoned and a single rope with Jumars or Prusik loops could be necessary. Please notice that when connectors/karabiners hit a pin work in flexion and bear 150-300daN max.,in other words even specific “K” karabiners were not built for such kind of stress,those rubber stoppers on the pins,cables with less tension,not to let karabiners hit the pin (French system) or chains instead of cables could be an answer for vertical impacts in properly called “vie ferrate” while “sentieri attrezzati” (equipped paths,i try to translate,e.g. Ivano Dibona) rarely present fall factor problems,only risks due to exposure or environmental factors and to the fact that “zero risk” doesn’t exist and we must accept it. Interesting and thought provoking. It certainly takes effort to reduce risk, but, as you say, it will never be risk free. Of course a wise person tries to calculate and reduce risk but there always is a thrilling percentage of uncertainty,as a matter of fact to consider and accept. I’m used to say that we risk only where we feel safe;would you worry watching Libby Peter climbing in free-solo? I would not! The main point is that people must take their own responsibilities and learn before going on the rocks because once there,you’re on your own and things can go wrong. Vie ferrate are a bad but easy way to start with alpine stuffs because all you need is few tools and some fitness and the beginners get the illusion to be skilled climbers in return,while they should thank shop attendants for having bought the right gear and mountain guides for having installed pins and cables and ladders and everything else for their safety. For example,why many people wear such via ferrata gloves and need a quickdraw or a daisy chain for resting? The answer is easy:because they have no idea of what climbing techniques are and they end up climbing cables instead of rocks. Anything goes as long as they don’t fall off,of course but i have a different knowledge of safety. When i climb and i realise that i’m using too much gear i feel uncomfortable because i’m not mastering the grade so next time i should climb an easier grade to feel completely safe and instinctively,i’ll use a correct quantity and quality of gear climbing a trad route,i don’t mention big alpine walls,in which so many factors are to evaluate and judge that grade of difficulty is only a aspect and some uncertainty is always present. Emil Solleder needed a day and twelve spikes to resolve the North-West face of Civetta,climbing many full sixth grade passages for the first time ever,a clear example of elegant climbing style perfectly safe on its own,creative and still modern because he anticipated free climbing on a great and now classic ascension:these should be the models to follow for a true and complete education. Reinhold Messner,who was very reluctant about gear in his alpine routes and very elegant as consequence,said:”I’ve seen so many people having fun on k letternsteig/vie ferrate,that i must approve them” I agree with him,but again,who educates them? I’m not sure I agree that vie ferrate are a bad way of starting out in alpine activities. I think the issue is whether people start alpine activities in a way that builds the skills and knowledge to be safe in the alps. However, I do agree that some people seem to start doing vie ferrate believing them to be very low risk and that they don’t need mountain and climbing skills to do them. That is clearly not good. I like your approach to making sure you climb within a grade at which you feel comfortable and in a way that meets your climbing ethic. It certainly feels more like pure climbing to climb a via ferrata without the cable, but I’m relaxed about whether someone holds the cable or not. I also think using a quickdraw for resting on longer vie ferrate or for stopping to take a photo can be a good thing if it prevents a fall. This is something I do myself. People need to have the skills to do vie ferrate safely and to approach them in a way they find fun. Messner makes a good point. Well,vie ferrate,ski tracks and other facilities has been realised for alpine tourism,without which Dolomiti area would be depopulated for emigration,like many valleys in the Alps. Vie ferrate are also easy to approach safely enough with little preparation,while having a knowledge about mountains in general is a completely different state of mind. I can compare this issue to indoor/sport climbing,which i like but it has not much to do with true mountains as any climber can acquire grades,forearms and technique but if their education is only that,i wouldn’t be much impressed:Comici/Fabjan route alla Sorella di Mezzo del Sorapiss is out there waiting for them,like countless 100 years or so old routes…this is an example to say that style,fun and safety are three aspects of the same issue and require complete,responsible people. Regards and Berg Heil-Heile Berge! Interesting and thought provoking points. The points you made were provoking in that they encourage people to think about certain issues. For example, they encourage people to think about how vie ferrate, tracks and facilities enable access to the mountains for people who might not have been there otherwise and might not have much experience. It makes you think about how much and in what ways mountains should be accessible and what this means for the safety of visitors. All interesting things to consider and it’s good of you to raise them. You have definitely caught my “dolomitic” points of view,in spite of my horrible English,and thank you for clearing up!